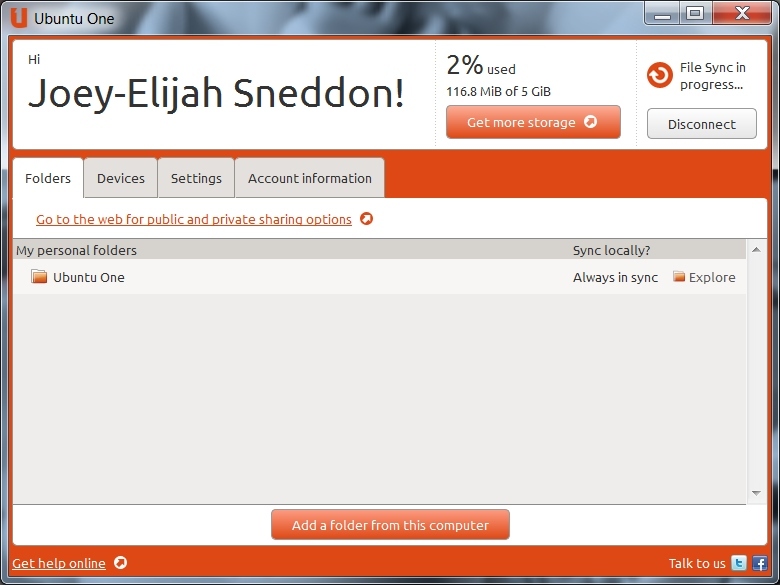 Ubuntu One For Windows Beta 2 Review - OMG! Ubuntu! The installer provided comes as a 21.7MB .exe. You will need to stay connected to the internet whilst installing to ensure successful account set-up, and installation of any additional packages required by the app. In a sweet move, presumably to save time, the installer also incorporates Ubuntu One set-up elements, such as signing in/creating an Ubuntu One account, and assigning folders to sync using the service. The Ubuntu One “Dashboard”, whilst not identical, bears a roughly similar layout to that found in the Ubuntu client: there are tabs at the top, disconnection, usage and sync status at the top, etc. Compared to the previous beta – which I have been using up until now – this second iteration is immeasurably less frustrating to use: it feels snappier in use, consumes less system resources and has yet to fully crash mid-sync. I was also disappointed to see that Beta 2 doesn’t come with any tray or panel-based animation informing you of progress activity. But this is a Beta release, and all things considered it’s a cracking one. The design and performance of this beta compared to that of last Novembers is impressive. It’s great to see that Windows user of the Ubuntu One service won’t just be handed a half-baked hack-job but a fully capable client in its own right.